They are residues of a dream world. The realization of dream elements, in the course of waking up, is the paradigm of dialectical thinking. Thus, dialectical thinking is the organ of historical awakening. Every epoch, in fact, not only dreams the one to follow but, in dreaming, precipitates its awakening. It bears its end within itself and unfolds it - as Hegel noticed - by cunning. They are not dream residues of a world, the nostalgic fantasies and fashionings of what once was. They are residues of a dream world, forming a historical border to the next era, but not as blueprints or utopian plans. Rather, as the unwelcome remainder, for what matters is neither manifest nor latent dream content. It's always the dream work, the underground currents that actually expose the loops and fuses of repression and its exceptions. The cunning of an era, then, is the dreaming of its own grave. Not its gravediggers. The dream image, that standstill halting of utopia and the dialectical image: what is it if not the graveyard? For in rejecting the immediate past and the hard work of the living to bring around a new world order, one is left instead with the far dead. The ambiguous image, the un-worked-through dream image, is that of the rustling skeletons. A necromantic toolbox, where we can refashion the dead into what we insist they could have been, and in doing so, clear a place for ourselves in the dead and never quite gone. Well, kind of like that. Steampunk is the false dream image. That falseness, however, doesn't lie in its being anterior (as the vision of a resolutely past era) or in it being too dreamy, too fantastic. Its falseness lies in it being the wrong dream image, the ideological blind that is the dream image proper to the liberal escape plan for the contemporary crisis and its envisioned fall-out. If we are witnessing the self-dismantling of the neoliberal order, we are witnessing also the eclipsing of cyberpunk, at least as we've recognized it so far. Cyberpunk was the dream image of neo-liberalism par excellence, albeit one that encoded within it enough short-circuits to wake itself again and again. The fantasies of a post-state corporate global order, yet with the canny awareness of the gap between the stated free-market ideology and the need for state support systems as guarantors of both corporate extension into recolonized spaces and the threat of naked force against militant labor movements. The visions of deindustrialization, of immaterial labor, of new hybrid multitudes, of nomadic subjects. Above all, of deregulation: the beast unchained climbs its waiting high-tech pedestal. And then the fall... In cyberpunk, neoliberalism did not see its inheritor, the dream of another world to come. It saw its own distorted mirror image of what it promised to be, its super-ego in all its taunting, sadistic glory. And in hastening to meet that image, it forgot the cunning of its unfolding and end. (For at the "end of history" in which we supposedly live, the old tricks of history are dead and gone, right?) The end of neoliberalism happening as I write is properly cyberpunk: not brought about by anyone in particular, no heroes or victors, no actors with discernible will or capacity for willful action. Just the system let loose upon itself, bubble after bubble hiding all those toiling bodies and unused factories. The general intellect swallows its own tail, its endless set of rational actors making rational profit decisions hollowing out the core of profit itself. Now, the reigning order promises new direction, yet one that digs into its bag of bones to join together new Keynesianism with a "weaning off" foreign oil. Throw back economics, getting back to basics, investing in material things but in a way that reverses the trajectory toward the gasoline-soaked apocalypse. The promise beneath this? Keep the technology, keep consumption, but make it "thougtful", make it conscious, make it responsible. Gild your laptop, hammer some bronze, and think of the slow dance of the new wind-turbines on the horizon. All in all, a participation in that great pasttime of the pseudo-Left, remembering the time that never was, back when life was simpler. Steampunk has this cake and eats it, too: the difference engine itself clacks and hammers out a dirigible and gear vision of intricacy without ease, of machines that never get out of hand, of taking the auto-pilot back into our own hands. This is not the dream image of our times. (Neither is the retrofuturist strand of dieselpunk, a related phenomenon.) Quite simply, because it is the manifest content of our dreams. It lacks the ambiguity that really halts and concretizes history, freezing to show the impossible past and the non-future (for it just shows the present bared) locked together. It has all the dialectical ambiguity of a Hummel figurine in a Robby the Robot outfit. That is more like it. What I propose in the place of steampunk, that weak handmaiden of Obama capitalism, is what I call salvagepunk: the post-apocalyptic vision of a kaputt world, strewn with both the dream residues and the real junk of the world that was, and shot through with the hard work of salvaging, repurposing, détourning, scrapping. Striving against and away from the ruins on which, like Machiavelli's toothed buildings that give a point of departure and support for the next construction yet which also demand of it a certain contact with the past, they cannot help but be built and through which they cycle. The definitive examples I have here: Marker's La Jetée (and Gilliam's 12 Monkeys as well), the Strugatskij's Roadside Picnic, Neil Marshall's Doomsday, Waterworld (as utterly terrible as it is), Godspeed You Black Emperor! and other derivations of anarcho-punk, Yamaguchi Hiroki's Hellevator: The Bottled Fools (Gusher No Binds Me), Jeunet's City of Lost Children and Delicatessen, certain portions of Wall-E. This scattered history of cultural visions of a scattered world after the fact. The Mad Max trilogy. I prefer to speak of these films as a subgenre of gasolinepunk (or the apocalyptic strain of dieselpunk, but I prefer "gasoline punk" as a differentiating mechanism from the Sky Captain and the World of Tomorrow sort of dieselpunk). 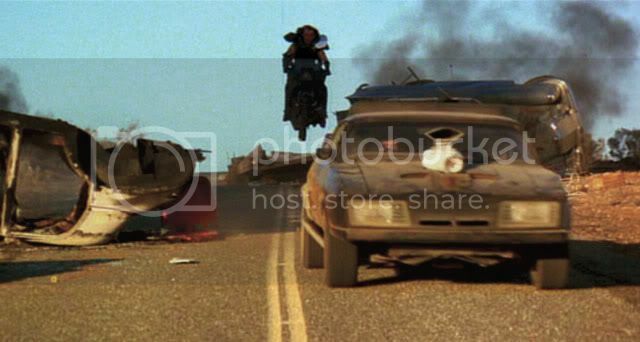 The Mad Max films, as the constitutive example of this genre, also give shape to its dominant political tendency. For what they envision, in the wake of nuclear war and the total collapse of the world system, is not the possibility of the reorganization of life but only its slow and inevitable teleological tendency toward a recreation of contemporary capitalism. In Mad Max, we see, still on the outskirts of the destroyed cities, the anarchic dissolution, the Hobbesian state of nature, homo homini lupus. In The Road Warrior, the collision between two orders: community formation and attempts to become permanent dwellers versus the nomadic hordes that stick to the previous mode In Mad Max: Beyond Thunderdome, the emergence of a market, new "city" formation, non-warlord managed life (in the autocratic force of Tina Turner), but all this still as an outpost amongst the wild, the wild in which one finds that the primitive tribes are those who still remain fidelitous the visions of the past (in short, of the advanced state of late capitalism). The standstill of post-history, crudely drawing on cave walls the pre-historic vision of the glories of the global economy. How do we repeat differently, then? Hellevator: The Bottled Fools points a direction, toward a literally underground possibility. In Hellevator (a rather remarkable J-horror that combines, at least for its first powerful forty minutes, the always-moving-standing-still of late Beckett with a filthier, obscene version of Gilliam's Brazil), we occupy a subterranean city traversed by elevators, seen above in the monolithic slab of the underground society. It is haunted through by the unspoken disaster that has forced dwellers below, under the fist of a totalitarian transit authority and their attendent Panopticon, a mole-life of grime and rules, of sararimen and salvage-men. The ascendent proletariat move vertically past the floors of their lumpenproletariat black market associates. All has the feel of salvage work, of an end to the digital age, returning to dials and gears and steam and pistons, none of the sleek sterilization of most sci-fi. As such, we are given to think that this is the space of those who have taken refuge. 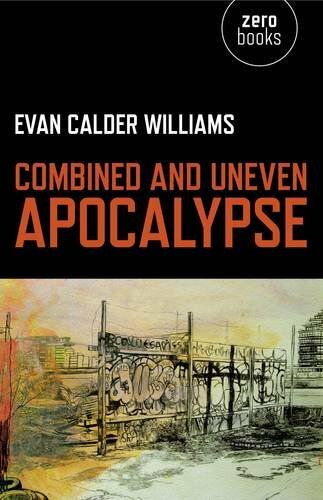 When the protagonist is banned for psychotic murders and sent up to the surface, one waits for a nuclear wasteland populated with the likely mutated outcasts. Instead, in the film's final frame, we see her emerge to stand before the Eiffel Tour, illuminated in the night sky. Schizoid hallucination aside, the final turn undoes the extra-narrative framework and shows us that this way of life is a choice, the choice of those who see their subterranean life as priviledge, the seclusion from the cunning and contingency of the world above. Perhaps, then, the salvagepunk world should be seen primarily as the dreamwork of choice and construction. Against the reactionary trendlines of Mad Max's doomed-to-repeat trajectory, it is a world of stealing from the ruins, robbing the graves, and rearranging the leftovers. ... to the clunking hull of Howl's Moving Castle. Not constructed to remake the world one mobile city at a time, but a principle of montage, of bits and pieces, rags and bones. Not the dwelling places and movements of a fluid multitude but something like our resistant will and the resistant materiality of all to be scrapped and repurposed from this world. Out of the Waterworld attraction at the Universal Studios themepark, we will take the objects designed to be the spectacular approximation of the end of the world's beginning, and we will sharpen fake oil drums into the real tools of dismantling and world-making, the gravedigger's spade and the necromancer's grammar of rust and bolts and thought. I've said before that there is something deeply strange about the over-provision of space, something very much hauntologically resonant. An almost empty city is perhaps more traumatic than an entirely abandoned one. The best example of this conition that I ever came across was Mirabelle Airport, outside of Montreal, which had over a hundred check-in desks, but only three flights a day. The food court could seat hundreds of people, but sat empty yet open. Staff drove the buggies up and down the concourse just for something to do, it was crazy. Too easy, you pick a central example that can be treated as a symptom: what about movies that already know this stuff, e.g. Escape From NY and LA? indeed, there's something about the last little remnants overcompensating, of those clinging on to the illusion. I think of the families trying to stick it out in the McMansion developments, those fabricated ghost towns emerging as the bubble burst. In a perhaps different register, the account Pausanias gives of the lingering traces of mythic Greece, over-providing the lineages of history that dwarf the meager leftovers. definitely. You know, I thought about Escape from New York for this entry, but decided to deal with it in the third part of this series, primarily because it is a striking example of disjointed timescales/uneven development/call it what you will. (Besides, I like saving my dialectical twists for third.) The island of Manhattan is post-apocalyptic while the rest of the world continues as before, or so the world system likes to tell itself. We get a vision in which the end of the world is not a world-wide event, but something that lives alongside us and that we'd prefer not talking about. I wonder if we're dancing on that particular grave a little prematurely. Isn't the bailout - that genius piece of taking over the debt without acquiring the assets - a surrender to the idea that we threw our collective lot in with the investment bankers and now we need them more than they need us? The fact that the Chinese own the US national debt suggests to me protectionism isn't coming back in a rush either - except in the form of the one-way protectionism that the big guys have always been practicing while the small guys were being bullied into slashing their tariffs and dropping their pants. So I'll reserve my judgment but in the meantime I fear we may be witnessing the undeadening of neoliberalism - killed with the wrong weapon, it shall become immortal. Which would still tie in nicely with the funereal imagery here as well as with your zombie sequel. We dream of steampunk knights, we are the junkpunkites. More seriously, though, the dancing on the grave is both premature and important. Not to say that shifts in the world economic order result from speech-acts, but a certain gathering storm of pessimism (combined with concrete analyses) seeps into public discourse and begins to discredit the system that produced it. I think the symbolic import of the bailout (as in, who needs who, whose lot has been cast where) is still unfolding. Though I strongly suspect that the soon-to-be-apparent lack of success (see GM angling for further cash) will drive the stake in properly, if not into the hegemonic weight of what remains of a neoliberal financial system but of the tattered remains of public belief in it as a project. Turns out the formidable Mr. Hatherley had thought of it first. It must have seeped into my subconscious. Also, I have the memory of a gnat. I'm rather more fond of the concrete analysis, I suspect the pessimism serves mostly to gets more people laid off more quickly. I'm also constitutionally a bit wary of the politics of glee, but that takes us way off track. I've been mulling over your recent posts a little bit more (would love to have something intelligent to say about the idea of surplus life, that's a very powerful concept) and I wonder if you see merit in considering recent American cinema - dependent, as opposed to independent - as a form of salvagepunk, with its endless string of remakes, adaptations, sequels.